Exactly 14 years ago today, Universal Studios Islands of Adventure put an amazing roller coaster into service. The Incredible Hulk is a steel roller coaster located in Islands of Adventure in Orlando, Florida, USA. It is named for the popular comic book superhero character, the Hulk. Voted the #1 roller coaster by Discovery Channel viewers in 1999, the roller coaster is unique because it features a launch lift hill as opposed to conventional chain lifts. This means the train accelerates to 40 mph (64 km/h) in a short time (approximately two seconds) before speeding through several inversions. 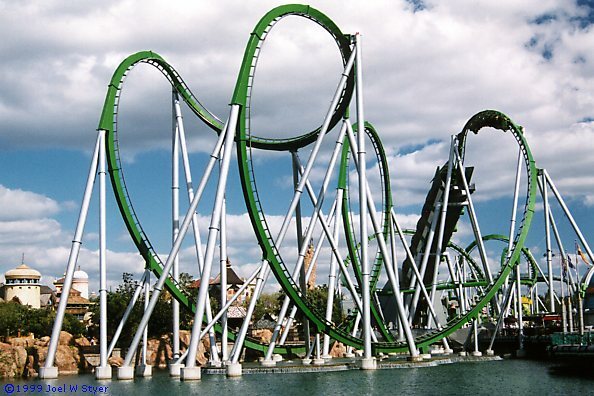 When the Incredible Hulk opened, it featured the world’s tallest cobra roll (110 feet (34 m). As a native Floridian, I was psyched to ride this monster! Imagine my horror and embarrassment when I got into the line fourteen years ago and found that I was *gasp* too fat to fit. Sadly, this was the story of my roller-coaster riding life as more and more coasters adapted to the Hulk’s steel style or twists, turns, inversions and flips. No longer could I enjoy the rides I loved. Fourteen years! Fourteen years of my life where I was lost to the love of riding because of my size. I’ve lost 115 pounds over the last two years. At 390 pounds, the idea of riding a coaster again was a faint memory…a dream at best. But as I began my journey to health, I set some intermediate goals for myself. The idea of the goals was to have small moments along the way that were important to me. For instance, one of my first goals was to drive with out my steering wheel rubbing against my belly. Another was to get under 330 pounds so I could play on the Wii. Another was to get under 300 pounds. Another of these intermediate goals was to lose enough weight to be able to ride the coasters. I started this process in November of 2011. I am proud to say that on May 24, 2013, I realized my last intermediate goal! I rode the HULK! Just a couple of weeks before, I had been at Six Flags over Georgia on Mother’s Day but the park was so crowded that I wasn’t able to ride anything other than The Mind Bender. This is a lap-locking mechanism and I had no trouble riding. I felt good about it, but I knew it wasn’t the same as The Hulk or Montu or any number of the newer coasters, so my jubilation was tinged with reservations. I went to the Batman tester seat, and was able to get it closed, but the girl at the tester seats was less than helpful. In fact, she didn’t even try to help at all, so I didn’t attempt to ride. I left somewhat dejected. The week before the trip to Universal Studios Islands of Adventure, I was researching websites about size limitations. It seemed that I would be ok, but I wasn’t sure. I was a bit hesitant as I approached the seats. I headed past the tester seats and just determined that I would wait to get to the track and work with the professionals at the top (as per the website suggestions I had gleaned in my research). I scoped out the modified seats – rows 3 and 6 and waited. My heart was beating and I was scared that I would have come all this way, told all these people in line and then be turned away. I sat down and heard the clicks! The attendant asked if I was comfortable. I said I was, but inside, I was freaking out a bit. The shoulder harness was tight. At least three more times, the attendant checked the harness and with each test, I got a little more panicked. I had to do some serious self talk to calm myself down. I had to breathe slowly and remind myself that I could in fact breathe and that this was something I’ve been waiting to do. Slowly, I began to relax and trust that all would be well. I have to confess something…all my intermediate goals were meaningful and I celebrate each one of them with joy and gratitude, but somewhere in the back of my mind, I allowed myself to think that this one would never happen. I didn’t realize that until I got off the ride. I had a few minutes to myself after the ride. I was sitting on the ground, texting my friend about what finally riding. It was in that moment that the reality of what had just transpired hit me all at once. He told me, “Your limitations are dropping right along with your weight. I am so proud of you.” I was moved to tears. Suddenly, I realized the real meaning of this success. The launch was A-MA-ZING – hurtling me toward a new life!!! Every moment of this ride was unforgettable. Every twist, every turn, every loop, every hill and even the finish will forever be burned into my memory as the moment I finally conquered the bulk by riding the Hulk! Romantic love…the stuff of books, poems, songs and legend. Why does this topic merit so much attention? What is it about love between two people that generates so much, well…emotion? It’s the thing that many of us search our whole lives trying to obtain, yet it is elusive. It’s the thing that many of us fall into…with no warning or preparation. It’s the thing that poets, artists and musicians try to convey in their works, yet never quite get it right…because love is too big. It is too difficult for us to describe in our finite states. We cannot comprehend love because it isn’t human to love…it is divine. That desire that we have to be in communion with another…that longing for physical touch and intimacy…that need to be needed…those aren’t accidental. We were designed to desire. We were created to caress. We were made to mate. Literally. It’s in our DNA to procreate, but that’s not all. The ultimate example of love that our Creator bestowed upon us, was not just the desire to make more humans, but the JOY and PLEASURE in doing so. The downside of all that joy and pleasure is heartbreak and pain when the love that we express to someone else is unrecquited. I have had my heart broken many times, I’m sad to say. The first time, I literally thought I would die from the pain. So heavy was my heart that I feared ever loving again, because I didn’t think that my little organ could handle the pain of another disappointment. But eventually…I dared to love again. And when that love didn’t last, my heart was again broken, but somehow less so. I hadn’t loved any less. I hadn’t lost any less. 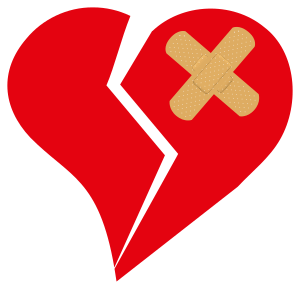 But my heart was better prepared and quicker to heal. I’ve been in love again. Twice actually. I love a friend who can’t return my affections, but strangely, that doesn’t negate the love I have for him. In fact, the way he has handled my feelings…his care and concern for me…has actually made me love him all the more. But because I love him, I will let him go so that he can have what’s best for him. Hope that the creator of my heart knows what I need. Hope that the man He has made for me will find me. And hope that my broken heart will be made whole again the next time I love. Because that is the true cure for a broken heart…to take what’s left of your heart, and use it to love again. Wow! I have been a bad blogger! *Bad blogger* I haven’t written a post since August of last year. So much has changed since then. After much prayer and deliberation, I decided to leave my job at Family First in Tampa to go back into the classroom. I have been teaching German at Central High School in Brooksville, Florida as a long-term substitute since August 24th. I applied to Asbury Seminary in the hopes of pursuing a Masters of Divinity, but have deferred that application while I wait to be hired full-time. While I really miss working with all the great people at Family First, I have to say that I absolutely love being back in the classroom. I love working so close to home…my commute went from over an hour to less than 15 minutes! And most of all, I love that I’m able to spend so much more time with my niece and nephew. I’ve continued to work on my weight-loss and I am currently at 306 pounds…about 75 pounds down from my highest weight. I haven’t been as dedicated as I should or could have been, but I continue to make positive progress. In fact, I have been in communication with the casting producers from The Biggest Loser and Extreme Makeover Weight Loss Edition regarding the next seasons of both shows. I’m also joining a “competition” here locally in Hernando County with a couple of girlfriends. On top of that, another girlfriend and I are walking together twice a week at one of our local walking parks. I’m highly motivated and committed to making all the changes I need to in order to reach my ultimate goal of 120-135 pounds and being the most fit of my life. So, I am sorry for being gone so long. I won’t make any promises I can’t keep, but I will say that it won’t be so long between my next post. Also, if you’ve been following my Weight Loss Wednesdays, I’ll be back in the swing next week. For those of you who love sweet tea as much as I do, I thought you might enjoy this cute little ditty by Christian comedienne, Anita Renfroe. She’s not really my cup of tea (hahaha!) as far as the funny is concerned…but she was right on the money about our Southern Table Wine. So sit back, tea in hand, and enjoy! I’ve been single for 46 years. This isn’t really my choice, but it is my reality. Part of my personality is to analyze and over think things as I shared in this post. My love life has not been exempt from this habit of analysis paralysis. I was talking to a friend of mine at work the other day and she said something that was eye-opening to me and really shed some light on the way that I have always approached relationships. She told me the story about the time when she was a little girl. She begged for a pet. Her parents got her this kitten and she was so excited. She was so happy to have this new little feline friend that she wanted to spend all of her time with it. She wanted to hold it, to pet it, to dress it up, and to have it return her abundant amount of affection. The only problem? The kitten was overwhelmed. It was terrified and wanted nothing to do with this little girl. It wrenched free of her affectionate grip and found refuge under the recesses of the little girl’s bed. Crouching in the farthest corner, the kitten was terrified and shaking. And my friend, chased the cat…trying to make the little animal love her back, but all the kitty wanted to do was to escape. My friend was heart-broken. She just wanted to love the kitten. She wanted to have the kitten love her back. She envisioned a playmate and life-long friend, but the kitten was in a new place, with new people and the only thing it saw was an invasion. What my friend didn’t know was that the best way to approach a cat is to relax and go about your business. The cat will come to you. So, what does this have to do with finding love? Well, the fact is that people are more like that little kitten when it comes to romance than many of us realize. At least more than I realize. About a year ago, I did some soul-searching and ending up fighting with God about the whole me still being single thing. At the end of everything, I decided to move forward and approached finding love with a kind of military attack strategy. I joined an online dating site. Now I don’t know about you, but when I realize that my current approach is not working, I have a tendency to swing, like a pendulum, in the complete opposite direction. So instead of being shy and retiring, I started barreling in head and heart first. In short, I was chasing the cat. And just like that little kitten of my friend’s, the men that I met ran for the corner! Understandably. I was simply overwhelming them with my desire for a relationship. And like my friend, I was heartbroken when they ran the other way. And just like my friend, I didn’t understand. Until she told me her story. All of a sudden, I realized what I had been doing. 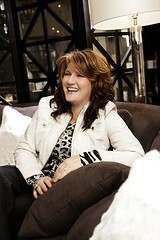 In my zeal for love and relationship that might lead marriage, I was being pushy. I think that a lot of people fall into that trap. We are so hungry to find love that we throw ourselves at the person we’re interested in. We smother them with attention and affection thinking that our enthusiasm will translate to becoming a couple. I wonder how many others are seeing this truth for the first time, too. You know, when I was younger and so confused about why I was still single, I would ask my older, married friends for insight. They would all invariably say, “When you’re not looking for it, love will find you.” That used to really make me angry. I couldn’t see the truth in their wisdom. I thought, “Pssh! Easy for you to say…You’re married!” I thought, “I’ll never not be looking for love.” But I think that I finally understand. What they were saying is don’t try so hard. Don’t push. Don’t chase the cat. If you will relax and be yourself, when love is ready, it will find you. Even then, she was telling us what my friend learned what the woman in the Song of Solomon was trying to say. If you are interested in finding love? Don’t chase the cat!